This was my second year attending the Marine Corps Birthday at Cookies in South Philly. Howard Schaeffer did the driving and I was very thankful for his knowledge of the area. Fred Babcock was also in attendance with me. It was a drizzly day but that did not dampen the celebration of about 2000 marines. We had beer, food, cigars, and camaraderie and a chance to connect with old friends. The Rolling Thunder MC was in attendance with their trademark rolling thunder. A traditional ceremony was performed by the founders of Cookies Tavern. Colors were present and taps was performed. Notable speakers were also in attendance. The Cookies trip was capped off with a trip to Gino's for a delicious philly cheese steak and fries. 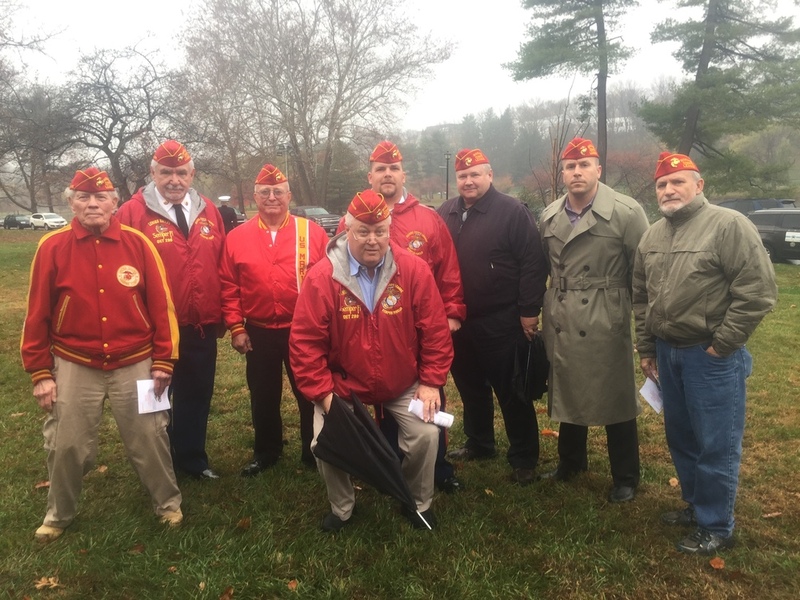 The Lehigh Valley Detachment and the Bethlehem Detachment held the 25th Annual Marine Corps Birthday Ceremony at the Marine Corps Monument in Allentown. Even with the rainy weather there was around 70 marines in attendance. There were several units there including both MCL Detachments, the Allentown Reserve Unit, and the local Leatherneck Nation MC. The ceremony was very well put together including the readings of several birthday messages. It concluded with several marines sharing their thoughts on what the Marine Corps means to them. After the ceremony concluded many in attendance went to the local Knights of Columbus building to partake in the traditional cake cutting ceremony. The tradition involve the oldest and youngest marines in attendance getting the first pieces of cake. Detachment members Charlie Helfrich, oldest marine, and Josh Brown, youngest marine, participated in the ceremony.